Tyler has a deep interest in all things digital. After studying Business Administration at CSU Monterey Bay, he immersed himself in the world of social media, digital advertising, and content marketing. When he’s not in front of a computer screen, you can find Tyler out hiking and enjoying the great outdoors or hanging out with friends in Midtown Sacramento. Shannon keeps the Appency team sane and organized. With over a decade of experience in human resources, finance, legal and operations, Shannon deftly keeps track of all the paper work (and paper-less work) in the office. Shannon loves to dance on ballroom floors or just around the living room. Aaron is a long time executive of the mobile marketing industry, having spent six years with ipsh! 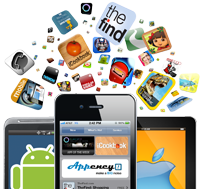 Mobile Marketing building a number of award winning mobile campaigns for major brands including Anheuser-Busch, Frito-Lay and Unilever. After ipsh, Aaron was recruited to start the San Francisco office of global mobile agency The Hyperfactory. In 2009, Aaron started consulting in the app marketing space, and eventually wrote the GigaOM guide to app marketing. He has helped dozens of companies understand and succeed in the app space and enjoys the challenges of an ever changing app economy. Aaron lives in Sacramento with his family and enjoys ballroom dancing, cooking, and board games when he’s not up to his eyebrows in mobile phones.